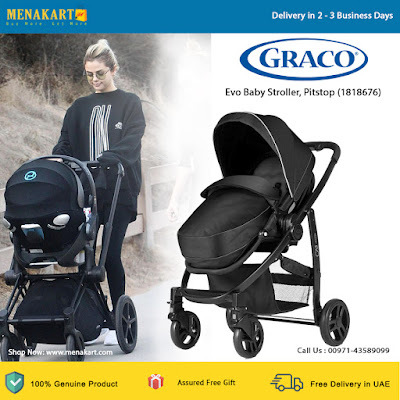 Welcome home the most efficient and cutting edge baby bearing carriage you would find: the Graco 1818676 Evo Baby Stroller. This little stroller is available in a neat and stylish looking Pitstop version that shows you mean business. Made for mothers who multitask, this baby stroller provides secure and comfortable conveyance for your baby, and flexible mobility and convenience for you. How is it comfortable? This stroller is built to enable a three position recline, which goes from a seating position to letting your baby lie down on his back. It also features a five point harness that holds your baby safely and comfortably, as you rocket down aisle after aisle. The stroller uses a soft fabric that is tested for toxicity, flammability and to ensure that it is colorfast. It also includes a footmuff and rain cover! Giving you more reason to get this stroller is the convenience that it offers. The stroller possesses a sturdy aluminum framework that is immensely flexible and features Graco’s one hand adjustment that lets you keep one hand free for your baby as your resurrect it.